We have been spending a lot of time expanding our web resources at BHS. It is amazing how many online resources have been constructed in the last couple of years. With all of our students toting web-enabled devices this year, our teachers have continued to increase our school's web presence as a method to communicate information and share resources and insights. 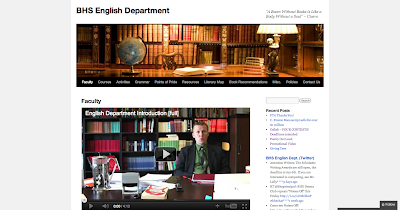 Here's a look at one of our most comprehensive sites, the BHS English Dept., which starts with a great introduction from BHS English Dept. Head Ben Lally (below). Courses Tab - Provides a great overview of all of the English Dept. offerings at BHS as well as a preview of some of the new courses we are planning on offering. Literary Map - This map provides a compendium of locations mentioned in BHS English texts. Book Recommendations - This is one of my favorite links, offering reading suggestions from our BHS English Dept. It's a great resource whether you are looking for a great book for yourself or looking for a suggestion to grab for someone else. You can subscribe to a daily e-mail with any new information from the BHS English Department Blog by typing your e-mail address into the box on the right hand side of the website.